Jaguar was a dominant force in racing during the 1950s. Ferrari was already a major player, and on the right day, Aston Martin and Maserati got their licks in. Porsche's star was rising, too, but it was Coventry's fast, dependable, and downright beautiful XK-120Ms, C-Types, and D-Types that commanded so many sports car and endurance races. 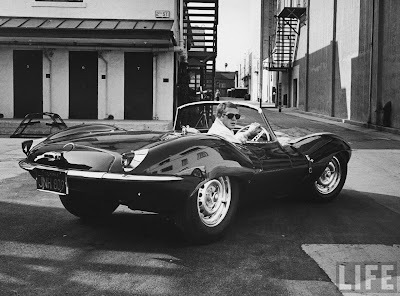 Jaguars won the 24 Hours of Le Mans five times that decade, notching the hat trick in 1955, 1956, and 1957, plus countless other professional and amateur victories in Europe and the United States. McQueen added his imprint to the 713. He repainted the exterior a more discreet British Racing Green. Tony Nancy restitched the interior in black leather. Von Dutch fabricated a metal glove-box door to cover the previously open storage space in the dash, purportedly to keep McQueen's shades from flying out of the cubby while he was giving the Jag a thrash. McQueen affectionately nicknamed it the Green Rat.